Why does Trump want to cancel the Energy Star program? It’s summer and the mercury is soaring. Temperatures are higher than ever, it turns out. Last year was the hottest year since humanity started recording temperatures, and it’s going to get much worse in the years to come, as a recent University of Hawaii study shows. The relentlessly hot conditions in many parts of the country this summer mean that our air conditioners and refrigerators are working harder — and burning through more energy — to maintain a comfortable temperature for our families and a safe temperature for our food. And we pay for this increased energy use in our utility bills every month. For me, it’s comforting to know that both my air conditioner and my refrigerator come with a little blue Energy Star label. Those labels indicate that they use less energy than comparable models without it. If you’re like me, you like to save money on your bills, and you probably look for that blue label when you buy household appliances. Energy Star is a government program that costs about $50 million a year to operate. It saves consumers about $34 billion (with a “b”) in energy costs annually. Put another way, every dollar in government spending on Energy Star produces $680 in broadly shared public benefits. That’s quite a return on investment! 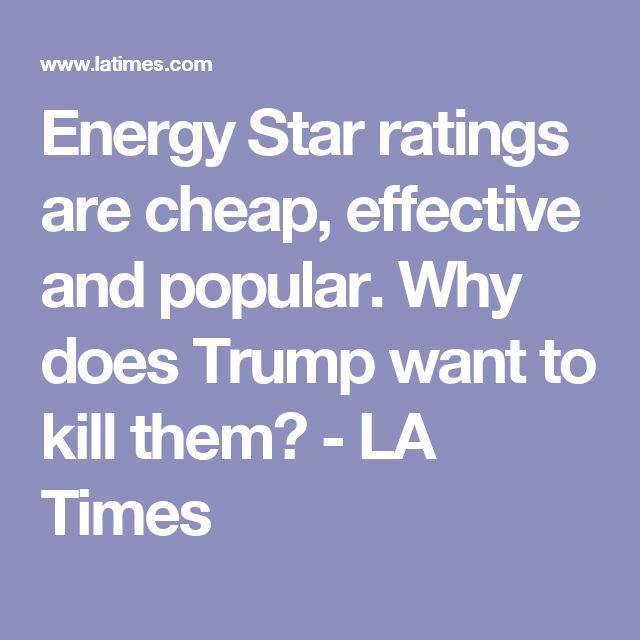 Why, then, is the Trump administration proposing the complete elimination of the Energy Star program? That’s right: The proposed White House budget allocates precisely $0 for the popular label. From the standpoint of serving people’s actual needs, this should be a non-starter. It would almost literally take $34 billion every year out of the pockets of regular people and businesses — and hand that windfall revenue to the utility companies who sell them electricity. It also means those utilities will burn more coal and natural gas, propping up the dirty energy industries this administration apparently loves. We’ll all be the ones paying for this love-fest between the administration and coal, oil, gas, and utility companies — in the form of higher energy bills, higher medical bills for asthma and other illnesses, and damages from heat waves, flooding, droughts, wildfires, and other impacts of releasing more climate-altering greenhouse gases. The administration routinely cites “jobs” as the justification for its attack on sensible energy and environmental policy. But energy efficiency employment totaled 2.2 million jobs last year, compared to 522,000 for coal and natural gas combined. That’s a difference of more than 4 to 1. So the administration wants to undermine energy efficiency, a proven job creator that saves consumers money, to prop up polluting industries with far weaker job creation potential. The excuse of “jobs” is just that — a flimsy excuse. The excuse of saving public money isn’t tenable either. The $50 million cost of the program is chump change for the federal government, given that overall federal discretionary spending is more than $1 trillion, and pays for itself 680 times over. Apparently, the Trump administration’s real intent behind eliminating Energy Star is to Make Utility Bills Rise Again, without regard to the very real harm it does to your household budget and to the environment. Basav Sen directs the Climate Justice Project at the Institute for Policy Studies. Distributed by OtherWords.org.